Few photos from the early 20th century history of American Orthodoxy are so rich in significance as this one. This was taken during the 1921 visit of then-deposed Abp. Meletios (Metxakis) of Athens to America, beginning the process of founding the Greek Archdiocese. He came traveling with Bp. Alexander (Demoglou), who would become the first Greek Archbishop of America. Meletios and Alexander did a remarkable amount of work toward uniting the Greek parishes in America, which were numerous by this time and deeply divided along political lines, with factions supporting either the Greek monarchy or the Venizelist democratizers. Meletios was later elected as Ecumenical Patriarch in November of this same year. 1921 also saw the arrival in America of Metr. Platon (Rozhdestvensky), who had previously been the Russian primate in America but had returned to Russia and now subsequently fled back to America as a refugee. His see was in Odessa, but with the encroachment of the Red Army, he abandoned it and was later popularly acclaimed as primate again in America (a status later denied him by Patriarch St. Tikhon, though possibly under duress from the Soviets). He and Abp. Alexander Nemolovsky flank Meletios. Alexander was the Russian primate in America at the time, though he would later resign in 1922 and return to Europe. In 1923, Platon was acclaimed primate. To the right of Alexander stand Bp. Aftimios (Ofiesh), the successor to St. Raphael Hawaweeny in the see of Brooklyn as head of the Syro-Arab diocese under the Russians. By this time, the Syrians were already deeply divided, with a rogue faction being led by Metr. Germanos (Shehadi), a renegade bishop who had abandoned his own archdiocese in Lebanon. 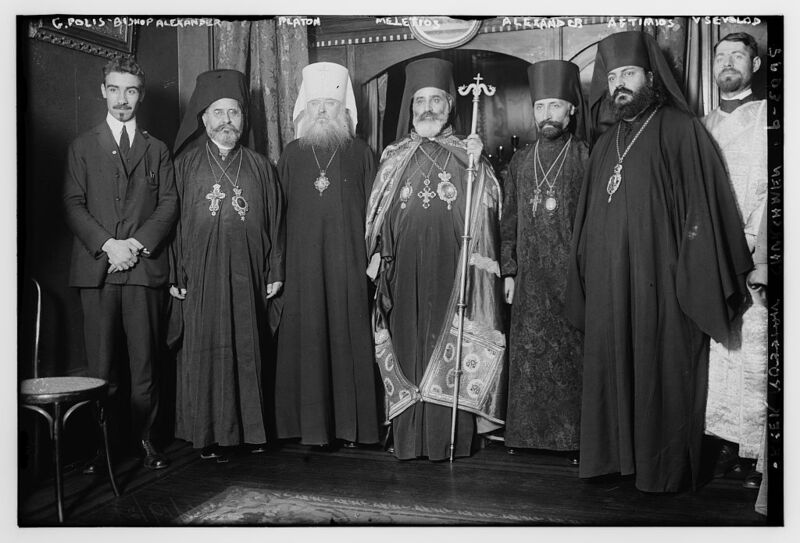 In 1927, with the imprimatur of Platon, Aftimios founded the American Orthodox Catholic Church, the first attempt at an autocephalous church for America. When Platon eventually distanced himself from the project, Aftimios repudiated the former’s authority and declared that he had had no right to be acclaimed primate, since he was so without the patriarch’s sanction. Next to Aftimios is Archdeacon Vsevelod (Andronoff), who was the cathedral deacon at the Russian cathedral in New York. Who G. Polis is (far left) is not clear, but he appears in several photographs from Meletios’s time in New York. He may have been a prominent local layman accompanying the bishop in his travels. The library at the OCA Cathedral in NYC is named after Archdeacon Vsevelod (Andronoff). A picture of him much later in life and looking much more severe graces its door. It was critical in my conversion. I’m not sure if your comment that “Whatever it may have included, it’s at least clear who is regarded as the senior cleric among them (Meletios), despite his status at the time as having been deposed from the see of Athens” – if this is to meant to imply the status of his ‘jurisdiction’ – stems from the photo itself. If the picture were taken at a church under Meletios and/or if he had just served Liturgy, then the above picture would make perfect sense even if he were considered the least of the bishops present. It would also be interesting to inquire as to the consecration dates of the bishops as the Russians tend to always order such things by seniority – if Meletios was the ‘eldest’ bishop by consecration he would be given the most senior position. Also, he had been (was still considered?) head of a local church, which would have been higher in rank than any other bishop present and thus given centrality, but his personal status as most senior cleric wouldn’t say anything about whether his ‘jurisdiction’ was seen as more senior in the US or wherever this photo was taken. The photo does say that these bishops seem not to have accepted Meletios’ deposition as making his canonicity in any way suspect. But, then again, St. Tikhon was fully vested in a photo with the Episcopal Bishop of Fond-du-Lac, WI with whom he was not in communion. Wonderful photo. Thanks for the resource. This snapshot in time (and in photography) I think clearly illustrates the chaotic nature of Orthodoxy in America in 1921. Two of these men were refugees (though of different sorts) — Meletios and Platon. It’s curious that Meletios is in mantiya while the others are in street clothes, though Adn. Vsevolod is fully vested. I don’t think that any of this implies anything in particular about “jurisdiction.” Alexander (Nemolovsky), the ranking local Russian primate, does not strike me as the sort who was trying to sort those kinds of things out. Even Platon, when he later took up the mantle, did not make any serious attempt to bring those outside his control under it. Given all this, it would not at all surprise me if Meletios were accepted as fully canonical. What a motley crew this is, though! Platon is probably some sort of monarchist, while Meletios is at least officially with the Venizelist democratizers. But they at least got along long enough for this photo to be shot. O to be a fly on that wall! Anyway, I’m not sure where this is. You can see that they are in some kind of chapel. My guess is that it is a sort of house chapel belonging to Nemolovsky, since the Greeks would not have been in New York long enough to set up such a thing. Incidentally, I dug this up while looking for material on Aftimios for my M.Div. thesis. Something I just noticed — Platon is wearing a white hat. Why is this? I know he did this after he became head of the Metropolia, which had split from the Moscow Patriarchate, but this photo was taken before that, when Abp Alexander Nemolovsky was still the ruling Russian bishop in America. He no doubt got the white hat when made Metropolitan of Kherson and Odessa, which was the diocese he fled before coming back to America. Odd, the Churches who insist on the EP’s interpretation of canon 28 refused to recognize Meletios (other articles show telegrams were sent from Athens, Constantinople etc. informing him the election was void), but he was recognized by those bishops who he said had no jurisdiction. “The new Patriarch is only 50 years old…He was born on the Island of Crete. His father Nicholas, and his mother, Maria, still live there. In 1889 Meletios went to Jerusalem, where he served as a novice with the Patriarch of Antioch. In 1892 he was ordained a deacon in Damascus and appointed to the Metropolis of Amida in Mesopotamia. A year afterward he came to the theological seminary of the Holy Cross in Jerusalem as a protege of the Patriarch of Antioch. He received the title of Doctor of Divinity in 1900. For the following ten years he was secretary to the Patriarch of Jerusalem. It is only a snippet view, and doesn’t include the picture, but the label names the bishops in the same order as the picture, under the captions “Prelates of the Greek Catholic Church Who Participated at the Proclemation of Archbishop Meletios Metaxakis as Patriarch.” and under is “Archbishop of Athens, in the Greek Church, has been elected Patriarch by the Holy Synod of Constantinople. It is the highest ecclesiastical authority and corresponds to the college of Cardinals in the Roman Catholic Church. Found a better result for the above. No, it is not our picture. It is another one, of the exact same time. The only prelates “of his own” would be the defrocked Bp. Alexander.